Families enjoy visiting the historic farm setting of Four Mile Historic Park all year round. The park offers numerous special events throughout the year, but the fall brings a very exciting celebration. The Pumpkin Harvest Festival is a great place to enjoy a cool autumn weekend. Visitors will enjoy horse-drawn wagon rides, exciting county fair games, and a beer garden boasting delicious brews. The kiddos will have a blast searching for a perfect pumpkin and building their own scarecrows. Historic tours and demonstrations will show visitors how people prepared for the fall season long ago. Fantastic local food trucks will be serving a variety of tasty treats. Admission to the event is free, but food and some activities require a small fee. You’ll want to make the sprawling 10-acre pumpkin patch your first stop at the Denver Botanic Gardens Pumpkin Festival. 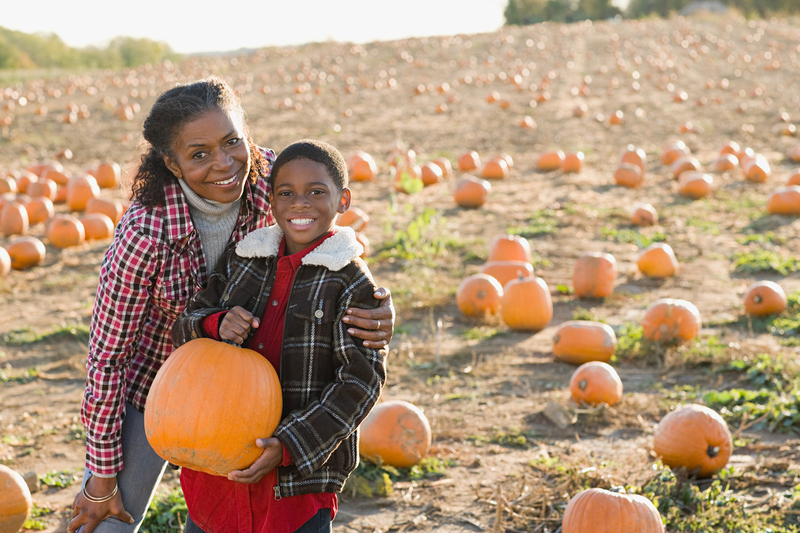 Kids love running through thousands of pumpkins to find their future jack-o-lantern. Load your pumpkins into a wagon and leave them at the free “Pumpkin Daycare” while your family visits the rest of the festival. The festival boasts numerous children’s activities that are sure to keep your little ones entertained all day long. Hayrides, bounce houses, slides, mini mazes, face painting, pony rides, and carnival games are just a few of the awesome attractions. Adults will enjoy live music while perusing incredible crafts and gifts at the vendor booths. Food trucks and vendors will be selling festival favorites like burgers, funnel cake, and ice cream. Admission costs $8 and free parking is available on site. Maize in the City is a family attraction where you can find everything you love about autumn. Free activities include a delightful playground and a corn kernel box. The corn kernel box is a hit with both kids and parents–imagine a sandbox without the messy, sticky, grainy sand! The expansive pumpkin patch has a wide assortment of unique items like beautiful white pumpkins, glossy cotton candy pumpkins, and wide, flat Cinderella pumpkins. Pumpkin prices are determined by weight and typically range from $1-$20. Families have a great time getting lost in the “Crazed Corn Field Maze”. This 20-acre maze includes checkpoints for an enjoyable smartphone trivia game. Guests should plan at least 40 minutes to spend in the maze. Ticket prices for the maze are $12 per adult, $9 for children (ages 5-12), and children under 5 are free. A smaller maze is available for families with young children–admission is $5 per child, parents are free with a paid child. Kids will also enjoy the festival’s pony rides ($6), petting zoo ($4), mini train ride ($3), and bounce houses (starting at $2). If your little ones like crafts, you should stop by the Sand Art Station. Kids can create beautiful art pieces with bright, colorful sand in a bottle. Prices range from $2-$10. These are just a few of the incredible autumn activities your family will enjoy this year. Please feel free to reach out to us at Dyllan Real Estate to learn more about the delightful Stapleton/Denver community.